Do you want to go on the holiday of your dreams, surrounded by family and friends in Normandy? 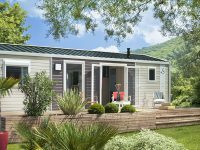 Welcome to Vallée de Deauville, where we offer mobile home rentals at a 5* campsite. We offer various accommodation packages to suit your needs and desires, so you can have a thrilling and unforgettable stay. 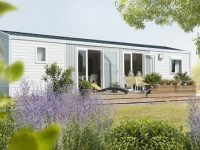 The campsite offers a full range of mobile homes. Designed for 2 types of family, choose between accommodation designed for 4 people or 6 people. Designed to meet all your every need, our mobile home rentals have 5-star facilities guaranteed. 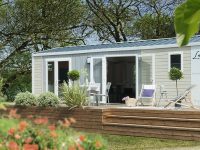 Our mobile homes are luxurious, spacious and comfortable – you’re sure to have a great holiday! This comfortable 34m² mobile-home has 2 bathrooms and sleeps a maximum of 4 people + 1 extra child under 12. A mobil-home of 25 to 32m ² any comfort with 1 room of bath and 1 dishwasher for 4 people + 1 child -12 years and sheets provided. 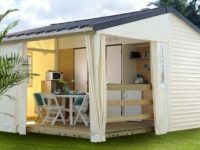 This comfortable 35m² mobile-home has 1 bathroom and sleeps a maximum of 6. This luxury 40m² mobile-home has 2 bathrooms and sleeps a maximum of 6 people. A mobil-home of 35m ² any comfort with 1 room of bath and a dishwasher for 6 people and cloths provided. Between the mobile home and the tent discover the Tithome and its 2 bedrooms. Without sanitary and without heating. 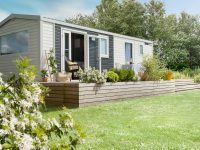 By choosing the 2-bedroom Comfort package, your mobile home will have a surface area of 25 – 32m². The accommodation includes two bedrooms, a furnished kitchen, heating and a bathroom with shower and separate toilet, and more. It also includes a lounge area with a sofa bed, TV and wooden terrace. More meticulous customers can always choose the 2-bedroom Luxury package for their mobile home rental in Deauville. Covering a surface of 34m², this comfortable accommodation stands out due to its master suite with a comfortable double bed (140x190cm) and a bathroom with shower and toilet. It also contains a lounge area, terrace, kitchen, second bathroom etc. Are you coming with a big family or group of friends? The 3-bedroom Comfort package is perfect for you. 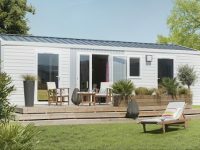 The corresponding mobile home covers a surface area of 35m² and includes all the advantages brought by our mobile homes (furnished kitchen, bathroom, toilet, heating, TV etc). It also contains a spacious living area for your activities. To satisfy all of your desires, we also provide the 3-bedroom Luxury package. Enjoy a master suite, with a separate shower and toilet, specially designed for your comfort and well-being, as well as two other bedrooms. Bed linen and towels are not provided for any of the mobile homes in the Vallée de Deauville Campsite – please bring your own.